They say, our eyebrows should be sisters, not twins. You just need to struggle a lot just to make them both look exactly the same from roots to tips. 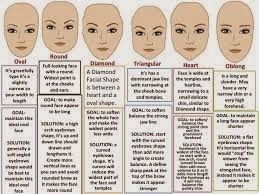 Some might not know, there are different eyebrow shapes suitable for a particular shape of face. Here is a guide on how you should shape your eyebrows to compliment with the shape of your face. I have a love and hate relationship with my eyebrows. There were days I like how it is done but there were days it looks like a mess that I couldn’t make it perfect although its well-groomed and I am doing the same routine. I hope that makes sense. But for today, my eyebrows pretty much cooperate with me maybe just for the sake of this post, lol. Here is how I basically do my eyebrows everyday. Nothing special actually, but I believe many ladies out there were also having a hard time in doing their eyebrows so I am sharing my technique that they might find helpful somehow. Or atleast give them idea of how they can do their own eyebrows. Here, I just used an eyebrow pencil and an angled brush. After I lined my eyebrow, I just used an angled brush to fill in my eyebrow. That wraps up my short post. Thanks for dropping by!